At Ascot Splicing we offer a world class range of Natural and Synthetic Ropes, manufactured in from exclusive supply partnerships where products are of the highest quality. From sisal and manila to polyester and nylon, be it for mining or fishing, construction or commercial, whatever the need, whatever the industry requirement, make Ascot Splicing your first port of call. Sisal Rope - is strong, tough and economical. Manufactured form fibres obtained from the leaves of the Agave Sisalana plant. Sisal is a tough, versatile fibre and is ideal for general purpose. Applications used: mining, general industrial, truck ropes, rope handles, barrier ropes, halters and nets, capstan ropes, driver ropes, tug -o-war ropes and slings. Main features: tough, abrasion resistant, resists external wear, versatile, non-conductive, biodegradable, easily spliced and knotted. Manila Rope - is strong and hardwearing. Manila rope is the stongest of the natural fibres and results in hard wearing, low stretch, general purpose ropes which are superior to Sisal in their resistance to weathering, fungal attach and moisture. Applications used: marine, shipping, lifting, capstan ropes, driving ropes, slings, rope ladders, cargo nets, safety nets and block fall ropes. Main features: smooth handling, soft feel, biodegradable, non-conductive, low stretch, weather resistant and good abrasion resistance. Aquatec Rope - high strength and UV resistant. Developed PP/PE crushed mono yarn blend then 3 stranded with the optimal lay for higher strength, excellent abrasion resistance and splicing. Applications used: marine, fishing, rural, heavy industrial, truck ropes, nets, rope ladders, foot ropes, tarpaulin ties, blasting mats, car tow ropes, air sea rescue lines, slings, control ropes and head lines. Superfilm Rope - highly abrasion resistant. 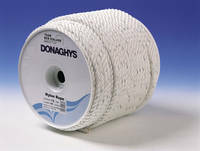 Superfilm ropes are easy to work and knot, are UV treated and have good weathering properties. Applications used: marine, mining, construction, rural, trucking, petroleum, commercial, fishing, rope ladders, truck ropes, nets, foot ropes, tarpaulin ties, blasting mats, car tow ropes, air sea rescue lines, slings, control ropes, head lines and ducting draw cords. Main features: tough, high strength to weight ratio, excellent handling and splicing properties, unaffected by water, resistant to oils, petrols, common solvents, bacteria and fungi. Polyethylene Silver Rope - Strong and versatile with excellent handing properties. These silver ropes are manufactured using a special polyethylene extrusion process which gives the rope superior strength and a distinctive hairy appearance which enhances wear resistance and knotting performance. Applications used: general industrial, marine, truck ropes, head lines, slings, industrial rigging, tarpaulin ties, foot ropes, tent guys, mooring lines and truck nets. Main features: superior strength, wear and abrasion resistant, excellent knotting and handling properties, flots, not affected by water and resistant to fungal attack. Applications used: general industrial, marine, safety sector, mast stays, slings, bolt ropes, lifelines, hoist ropes and safety lines. Main features: soft feel, not affected by water, low stretch, high abrasion resistance, torsion resistant properties under load. 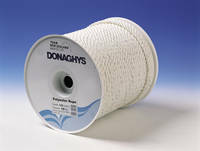 Nylon Rope - Ideally suited to a wide range of general and industrial applications. Applications used: slings, forestry ropes, anchor ropes, safety lines, safety nets, mooring lines and car tow ropes. Main features: good strength, abrasion resistant, low water absorption, high extension and recovery, soft feel, easy handling, coils and knots extremely well.